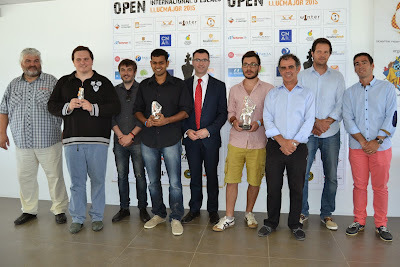 At the tournament LLucamjor, against all odds, the the surprise came from the German player Kohlweyer and the Turkish IM Ogulcan, both starting from positions 37 and 23 respectively, who were not the favourites in a tournament where 22 Grand Masters took part, some with FIDE rating of over 2600. Both players played an exciting final game where the German was half a point ahead of the Turkish IM, however had to tilt the king against Ogulcan who thus won the title with 7.5/9 points. The winner was followed by a group of 6 players with 7/9 points, among whom we see Sergio Estremera, who has done a splendid tournament, however after applying tie-breaking rules GM Prasanna of India and the Ukrainian Sumets came in second and third place respectively. The winner Kohlweyer gets the title of Grandmaster while Marta Michna, Titas Stremavicius, and Thiel Tomas get the title of International Master in this tournament where German players have had an important role showing very good results. 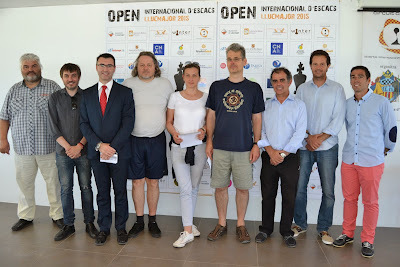 The Mayor of Llucmajor Juan Jaume, with Toni Campos - tourism councilor, Carles Vich Balearic Chess Federation president, John Oliver - Llucmajor club president and International Organizer Sebastià Nadal attended the awards ceremony.